So far it’s been a great school year at Shoreline Cooperative Preschool. We’ve gone on lots of field trips, celebrated many holidays, and have had fun learning in our classrooms. The time has gone by fast! February is over (finally) and that means that spring is heading our way. Even though it will inevitably seem like just more rain and grey skies, the plants know the difference and we’ll start to see growth and greenery all around us. This is a great time to introduce/reinforce the concept of seasons as well as seeds and gardens. The month of March is typically when gardeners begin to prepare for their plantings by germinating seeds indoors, to be transplanted outside when the weather allows. A lot of us don’t have yards that are adequate for a garden, or the time/energy for a full scale garden. Don’t let this stop you! It’s easy to plant a few herb seeds in a small pot and keep this indoors for the entire growing season. It’s best to place whatever indoor pots you have in a south facing window, as these are the windows that receive the most light. After the seeds are planted, all you have to do is keep the soil moist until they sprout. Then it can be a daily activity with your child/children to check the little plant and see if it needs water. Kids love to watch things grow and be a part of the process! It’s even funner when you can pluck a few leaves of basil or what have you to eat with dinner. It makes the connection between living plants and our food that is often missing in city life. One of these 4×8 foot beds can harvest up to 80 lbs of tomatoes! Again, you want to find a place in your yard that has good exposure to the south. Instead of direct praise, try and give your child the words he/she needs to describe their own feelings. For example, instead of saying “I’m so proud of you for _____” I now ask my son after he does something I’m proud of if he feels proud for ______. So far he has responded well and will even run around the house declaring how proud of himself he is. It’s great to see his independence with his feelings! Jody taught us the analogy of being like a tree regarding the pushing and pulling that our children will always do. It’s good to remember that we have solid roots that keep us grounded and those are our morals and philosophies. However trees bend in the wind but they do not (usually) fall over. So instead of being rigid against the demands our children make, we can give a little but still stand firm. We can acknowledge in a loving way what they are wanting and also deny them that in a loving way. That love we show while standing firm is the slight give of the tree. It helps to take a deep breath when the stress levels rise (ie: a tantrum is ensuing). There’s nothing wrong with our children being upset. It’s bound to happen, and it seems like we’re obsessed with preventing it in the name of “happiness.” However it’s important to let them feel the full spectrum of emotions so that they can develop good coping mechanisms before they reach adolescence, when we desperately need them to have good coping skills. Also, it’s okay for our children to see us upset and/or cry or be emotional. That is a human quality. What’s important is the way we deal with these emotions in front of them. Modeling is how they learn. We all make mistakes, parents and children alike. We will continue to make mistakes. It’s important that we remember for ourselves and teach our children as well that even though we make mistakes, that does not mean we are mistakes. Go ahead and pat yourself on the back, it’s hard work being a parent. These are just a few of the things that I found to be especially valuable. I’m sure that others attending took equally valuable things away from the talk. We have been blessed by a number of excellent guest speakers that are an invaluable resource in this ongoing process of learning to parent. I for one am extremely grateful to have been present for these presentations. Feel free (and please do) leave comments regarding your experiences with these speakers! My oldest child is graduating high school and wrapping up his youth sports career just as my youngest is beginning her youth sports career, and I’ve been thinking about what a great time we’ve had. I learned a lot about myself as my son progressed through his career, and I think my experience is worth sharing with other folks with kids starting out in youth sports. Over the years I’ve coached soccer and Little League baseball, served as a board member, shuttled kids countless miles to and from practices, participated in fundraisers, and watched games and practices in rain, sleet, snow, and even blazing sun! I’ve put in my time, and it has been worth it. I’ve noticed parents of former students at many high school games lamenting the fact that their kids are through. The years of youth sports were golden for them, as they have been for me. Youth sports impacts most kids, whether or not they participate. Youth sports also affects most parents. I’d like to help parents think about their children’s upcoming youth sports careers, the outcomes they envision for their kids, and the strategies most likely to achieve those outcomes. Successful youth sports experiences depend on setting realistic expectations and modeling appropriate behaviors. So what expectations are reasonable, and what behaviors should we model for our kids? To answer these questions we must first consider each child’s individual characteristics and their maturity level. Parents seem to go through an evolutionary cycle as their children progress through youth sports. When their kids first start out, they are very intense about outcomes, but as their kids grow, they accept outcomes better. I know this was true for me. I’ve learned that it really is about “how you play the game,” rather than whether you win or lose. (I can’t help adding a caveat here: it is more fun to win…) Keeping the big picture in mind from the beginning will help you and your children avoid a lot of angst. Nothing will influence your kids’ sportsmanship more than your own behavior at games. Our definitions of success are instrumental to helping our kids. Many kids subconsciously know it is important to give all of their effort and be a team player, but on a conscious level they just want to play and win, and be part of the team. Keep in mind that as they get older their motivations will change. Kids do love to win and hate to lose, but they usually get past the ups and downs sooner than their parents. Many parents understand this, yet still have difficulty acting appropriately in game situations. It is natural for our emotions to carry the day (or get carried away) at a sporting event, so good advice is to anticipate game day emotions, and be prepared to demonstrate good sportsmanship. Motivation to participate in youth sports varies. While statistics suggest seven of ten kids don’t care about the score, the flip-side is three of ten kids do care, and your child may be one of them. Many young athletes simply want to be playing with friends: while others are in it for the thrill, or simply love the sport or want to improve their skills. Yet still others participate for the group association; they want to get the sweatshirt, to add this activity and these friendships to their identity. Our job as parents is to assess our own kids’ motivation and tailor our message to promote and encourage their involvement. In my opinion, the measure of each coach’s success should be how many of the kids on their team return for another season. It is important to keep kids involved because once they drop out, it becomes very difficult to re-enter a sport. Complaining about coaches (they defend coaches to the teeth). We all know we should emphasize the values of doing one’s best and demonstrating good sportsmanship; however, it is difficult to maintain composure in the heat of the moment, so plan ahead. Consider how your actions will appear. If you know you are inclined toward demonstrative behavior, then it would be wise to plan alternatives in advance. Many successful parents are those organizing ice cream or pizza for after the event, or otherwise engaged in helping out. If you have taken the leap and engaged as a parent-coach, I can provide a lot of advice for you, but it is far beyond the scope of this article. Suffice it to say that you must separate the role of coach from parent, which is nearly impossible. My advice: use these words, “now I am the coach, and I have twelve kids relying on me,” and “now I am your parent, I want to listen;” and ask your child to refer to you as “coach” on the field. Participation gets more difficult as kids get older. Twenty million kids register each year for competitive sports, yet 70 percent quit playing by age thirteen.#,# What causes them to drop out? Part of the explanation is that there are fewer opportunities as kids reach high school. However, a contributing factor is parents’ failure to emphasize the value of participating. As the definition of success changes from doing one’s best to winning, it is hard for many to succeed. There are many sports opportunities available at young ages, and with messages tailored to each child’s needs, I think all of our children can find a sports opportunity that will carry through their high school years, and we’ll all be better off for it. Copyright © 2012 David A. Hammond. All rights reserved. Used with permission. Inventors: Diet Coke and Mentos Geyser! Our Inventors class puts candy in soda pop. For Science! Just a quick reminder, this Friday April 8th is Spring Fling. Featuring activities for the kids and an ice cream social. Whole families are welcome. In the school gym 6 – 7:30pm. Today was PJ day at school. It was fun to see everyone wearing their favorite pajamas, parents too. The Imagineers also had a visit from CleanScapes. We learned about recycling, what items we can recycle and what we should compost or put in the garbage. We also learned of the different ways items can be reused or remade into something else. The kids brought items from home and got to put them into the blue recycling bin. We heard a few stories and then everyone put on their safety glasses and reflective vests. 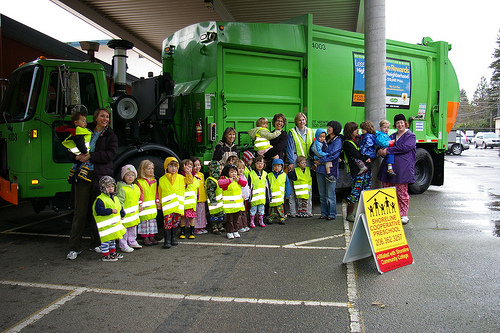 We headed outside and waiting for us was the CleanScapes recycling truck, where all our items were recycled. We were told how the truck works and everyone got a chance to sit in the driver’s seat of the truck. A very exciting and fun day at preschool, thanks to our friends at CleanScapes for taking the time to teach us about recycling. This year, I’ve heard several parents talk about how much their Imagineer is really into the idea of preschool workbooks. At our house, it’s become a part of the day. Immediately after supper, D asks to “do the workbook”. Here are a couple of workbooks we’ve really enjoyed along with (because they can be a little spendy when you’re burning through them!) a couple of sites with lots of printables (FREE!). Richard Scarry’s Big Busy Sticker & Activity Book: A great book for Busytown fans! It’s loaded with really colorful pages and all kinds of activities and games. In addition there are literally hundreds of stickers to be used for all of the activities. It takes a little searching around at times to match the stickers to the pages, but you’ll get the hang of it. They’re all letter coded. I only wish they made the sticker pages perforated as we opted to pull all of the pages out (before D stuck them all!). Brainquest Workbook: This was also a really great book. It’s organized into color-coded sections by topics (numbers, letters, etc.) and lasted a long time. The pages are all full colored and it’s a pretty thick book. TLSbooks.com: This site is nothing fancy, but is chocked full of printable sheets. We printed them all up double sided to save paper. They are listed by type of activity and there are lots and lots of pages. Kidslearningstation.com: It takes a little clicking around to get to the pages that you want to print, but they have a nice selection of activities. Do you have a favorite site? Feel free to comment below. As always, if you want to purchase the workbooks mentioned above, please use the links below for Amazon to support SCP! Author scpadminPosted on February 20, 2011 Categories MiscellaneousLeave a comment on Workbook Fun! It was the start of the Lunar New Year this week, and as usual Teacher Patty was helping us celebrate in style. In the Imagineers class we were playing with Mah Jong pieces, drawing and painting Chinese characters, reading books about Chinese New Year, eating fortune cookies with our snack, and some of us even wore beautiful silk clothes from China. The highlight of our morning was probably our parade down the hallway, with half of the kids as the dragon and the other half beating drums. I’ve posted a bunch of photos to our Flickr account. Check ’em out on Flickr! Author scpadminPosted on February 5, 2011 Categories MiscellaneousLeave a comment on Gung Hay Fat Choy! We are just starting the search for a teacher to teach to the Discoverers class this fall! This a part-time role and a great opportunity to work at an awesome school. If you know anyone who might be interested, the job description and application information can be found on the Shoreline Community College website. Check it out! Author scpadminPosted on January 28, 2011 Categories MiscellaneousLeave a comment on Discoverers Teacher Opening! In case you missed them, below you’ll find books from our last meeting with guest speaker Connie Dawson, Ph.D. She is the mother of 3 and grandmother of 8 and a former therapist working with families and childhood attachment problems. She taught in the counselor education program at Portland State University and is currently writing a book about 7 unposted rules that govern relationships.